Otto Apuy is one of the most recognized artists in Costa Rica. He participates in what seems to be almost every medium of art (sculpture, painting, drawing, and as you will see below mosaics) and he has also published several books of literature and poetry. We visited La Iglesia de Cañas several months ago as we were traveling north through the country to see Allison’s family and my brother in the Guanacaste region of Costa Rica. Below the pics see a small excerpt from this link regarding Otto Apuy. One of his most spectacular works is the Iglesia de Cañas, (Cañas Church). Apuy designed and directed the envelopment of the entire church in colorful mosaic tile, which has put Cañas, on the map as a place to visit. In a country of many beautiful and impressive churches, this one has to be at the top of almost every list. Apuy has used both whole and broken tiles in glossy, vibrant colors to depict both religious and abstract themes. The church’s central tower, which is entirely covered in mosaic, is nearly 30m (100 ft.) tall. Estimates indicate that more than a million pieces of ceramic were employed in the work. This is what it looks like when you get caught in an tropical rainstorm unprepared. Welcome to Costa Rica! The Motsingers are good friends from our time in Corpus Christi, TX. We have been repeatedly blessed by their faithful friendship to our family. Not only are they good friends, but they live as an example to many by their compassion and service to others. They have two sons from Ethiopia who are blessed to have these two capable Christian parents. As I watched them serve their children, I could not help but think about how blessed those kids are to have the parents God has given them. I am confident that Jon and Joy are the perfect parents for Seth and Oliver. I am challenged by the idea of adoption, how it is a symbol of God’s love for us, and I am blessed by how the Motsinger family is living this reality. I also am encouraged by their generosity to support us by visiting us in San Jose. I know it was both a blessing and a sacrifice for them to come, and again it reminds me of how it so often works out like that in the kingdom of God. Thanks for coming Jon, Joy, Seth, and Oliver! Some news from Diospi Suyana. 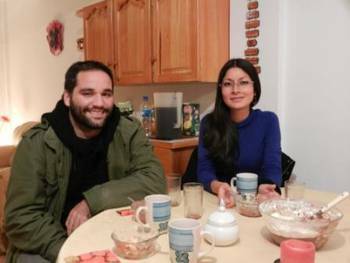 Federico Romero (left) and Karen Espejo (right) eating dinner at the John’s house. They arrived yesterday at 11am and will be leaving this morning. This means journalist Karen Espejo and photographer Federico Romero have 23 hours to produce their story about the Diospi Suyana hospital. About what will they talk, what about the missionary hospital do they consider relevant to the readers of their weekly magazine? Maybe their audience would be moved by the stories of our patients, who come to Curahuasi, often times from far away, in the hope to be healed. Or will they talk about the missionaries? Almost all of the hospital volunteers can contribute their very own chapter to the story about Diospi Suyana. Most likely, the journalists will mention the hospitals’ modern equipment – the “high tech hospital for the poor” aspect. We do hope that they will talk about the essential role that God’s will plays in the story of the hospital, especially since the Peruvian mass media called Diospi Suyana, “the hospital of faith”. Let’s suppose that you were going to sponsor someone to, say, learn a language. What if that person turned out to be the number one go-getter of the language learning school? What if he did every homework assignment and even more to make sure he understood a concept? What if he took every class he could, even the most advanced translation class, and recently translated seven pages from his mother tongue to the target language? What if he went to optional tutoring three times a week? What if he increased his workload by also doing a language speaking route through the neighborhood, guided by and accountable to his tutor but without a grade, trudging through the rain to practice his memorized texts? What if at night, he spoke to his spouse in the goal language and before bed he read a fiction book in the new language to improve his vocabulary? Wouldn’t you be pleased with your investment? Wouldn’t you love to know that he is one of the most improved students at the school? Wouldn’t you feel that you had gotten your money’s worth out of this language learner? Wouldn’t you smile to think that he will be the same kind of doctor, with diligence helping many people who have nothing? Wouldn’t it please you to imagine him using his new language every day to change people’s lives and show them the love of Jesus? If he were your spouse instead of the person you sponsored, wouldn’t you want to tell everyone about him in a blog post with too many rhetorical questions? Well, I would. We are heading home to Dallas, TX in three weeks. We will be at the airport at 6:45 AM with our approximately 20 bags ready to board the airplane for the 4 hour flight home. 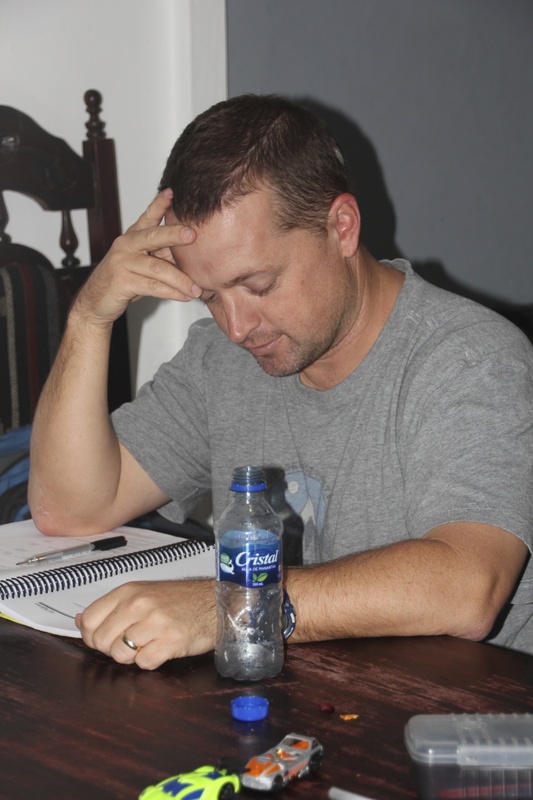 It has been a good helpful, hard, challenging, year in Costa Rica learning Spanish. However, I can feel the pressure starting to grow as we think about the things we need to do before we leave, and also as I think about the things we want to do when we are home. One thing that we are realizing we cannot do when we are home is see everyone that we want to see (and we truly really want to see everyone.) This trip is a short stay in the States to visit with our family, pack for the cooler climate of Peru, purchase things we will need there, do Visa work, and then last of all hopefully to rest just a bit. It is not a true “Furlough” or “Home Assignment” if you are familiar with either of those terms. Often (usually) families come home from the mission field for a minimum of three months and sometimes for a year to visit again with their supporters, raise new support if needed, rest, retrain (especially those who are in a professional field like medicine where being up to date is very important), and to process what they need to do in the upcoming years in their field of service. There is a good article on a missionary furlough or home assignment at this link titled Why do Missionaries go on Furlough?. It is likely that our first true Home Assignment will be during either the winter months of 2014 or 2015. We will have to work our scheduling with the other missionaries who are serving at the hospital to be sure that the hospital remains well-staffed when we leave. If you think to pray for us we have these prayer requests regarding this next transition. That there will be peace and efficiency as we pack. Good closure as we say goodbye to Costa Rica and our friends here. That the kids will adjust well to two big changes in the next two months. We will make all the connections we need to make when we are home. That our friends and family who are supporting us for whom we are so thankful, especially those that we may not be able to see when we are home, will have merciful understanding of the short, business nature of this trip home. That we could be a true blessing and encouragement to the friends and family we will get to see. That we will process the guilt and regret we already feel in regards to how short this trip home is and how it limits our ability to visit with people we want to see. That we are psychologically, physically, emotionally, and spiritually ready for the adjustment of living in the rural, isolated, mountains of Peru. Thank you for praying and thinking of us here in Costa Rica. I hope we see you soon!